Shaft design on the Soft Touch Bendable Utensils allow the utensils to be bent for left or right angle. The built-up, soft-touch bendable utensil handle makes it easy to grasp and hold onto. Soft touch Knife features a curved style rocker blade. 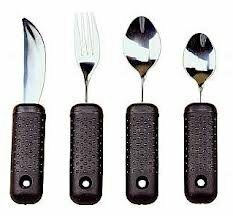 Soft Touch Bendable utensils are Stainless Steel and dishwasher safe.